Generation V: Majority of Internet Users are Lurkers! I often check out MarketingCharts to observe online statistics and stumbled upon an interesting report from Gartner concerning Generation V last week. This report attempts to outline and categorize internet users. 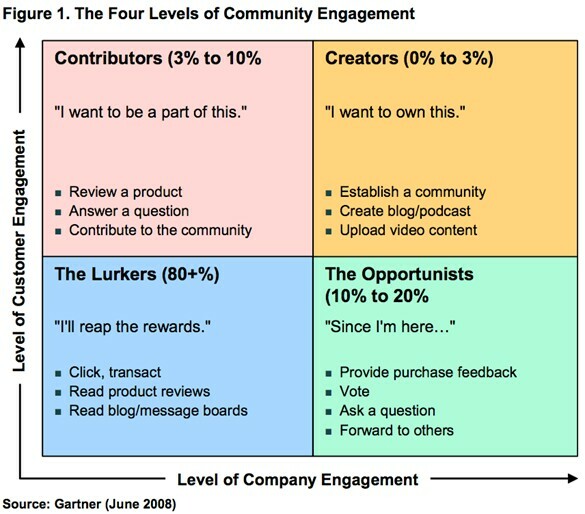 Apparently, we are either creators, contributors, opportunists or lurkers. Although I agree for the most part, I’m not sure it’s that clear cut. As for myself, I believe I have elements of each a creator, a contributor and an opportunist – I’m not sure who would admit to being a lurker (but that’s just me I suppose). What about you? Approximately 80% will be lurkers, essentially spectators, who reap the rewards of online community input but absorb only what is being communicated. They can still implicitly contribute and indirectly validate value from the rest of the community. All users start out as lurker. Please feel free to comment on this. I’d love to see if I’m the only one who thinks these findings are slightly generalist. Next postIs an overall reach better than an obvious niche? Interesting topic, I would have to say that I think that this is an accurate assessment for GEN V (GV? for future reference..?)today. I suspect that as 2.0 develops further the numbers will skew towards more contributors and less lurkers. Lets be honest, everybody likes to put in their 2 cents worth (case in point with this response).